Sudden Oak Death > What is Sudden Oak Death? The information below provides both quick answers to general questions about Sudden Oak Death, as well as more in-depth information. Learn about Sudden Oak Death in the larger context of the role of tree disease in the forest in Ecology of Tree Diseases. Also read more in the Frequently Asked Questions (FAQs) and connect to external information about P. ramorum and our partners on the Links page. Phytophthora ramorum is the cause of both Sudden Oak Death, a forest disease that has resulted in widespread dieback of several tree species in California and Oregon forests, and Ramorum blight, which affects the leaves and twigs of numerous other plants in forests and nurseries. For the complete disease chronology, visit our Library. Multimedia overviews are also available: video overview by Dr. David Rizzo, UC Davis, on UCCE Sonoma website and radio interview with Dave Rizzo, Yana Valachovic, and Leonel Arguello. Overview Video January 16, 2008 — This program examines the disease Sudden Oak Death (SOD) which is attacking oaks and now other trees and plants. 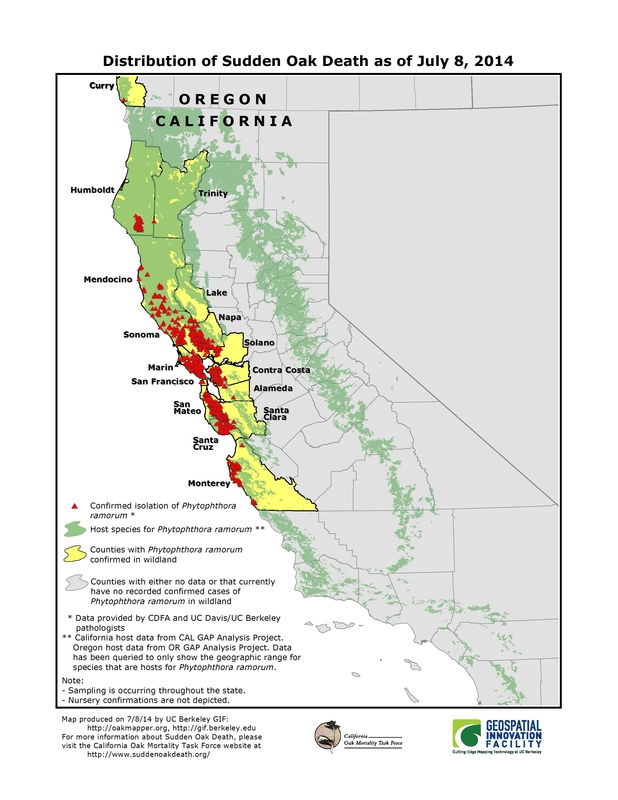 Since the mid-1990s, Phytophthora ramorum has killed millions of tanoak trees and several oak tree species (coast live oak, California black oak, Shreve oak, and canyon live oak), and caused twig and foliar diseases in numerous other plant species, including California bay laurel, Douglas-fir, and coast redwood. The pathogen was also discovered in European nurseries in the mid1990s, and it has since spread to gardens and wildland trees most notably in the U.K. where Japanese larch in plantations are being killed in large numbers. Although the first P. ramorum-infested rhododendron nursery plants, were identified in 2001 (in Santa Cruz County, CA), the U.S. nursery industry was not widely impacted by the pathogen until 2004, when a few large West Coast nurseries inadvertently shipped over a million potentially infected rhodendrons and camellia plants throughout much of the United States with detections in 176 nurseries in 21 states. The origin of Phytophthora ramorum is not known. P. ramorum thrives in cool, wet climates. In California, coastal evergreen forests and tanoak/redwood forests within the fog belt are the primary habitat. Research in California forests has shown that the greatest predictor of P. ramorum is the presence of California bay laurel (Umbellularia californica). Nurseries outside of these cool, moist areas often create microclimates which mimic the preferred environment of P. ramorum and allow it to grow and spread far from the coast. Phytophthora species are water molds that are well known plant pathogens. They are water-loving and produce plentiful spores in moist, humid conditions. While most foliar hosts do not die from the disease, they do play a key role in the spread of P. ramorum, acting as breeding grounds for inoculum, which may then be spread through wind-driven rain, water, plant material, or human activity. Trunk hosts such as oaks are considered terminal hosts – the pathogen does not readily spread from intact bark cankers – and they become infected only when exposed to spores produced on the leaves of neighboring plants. The APS Education Center also has a disease lesson for P. ramorum which includes illustrations of proposed disease cycles, among other biological information. 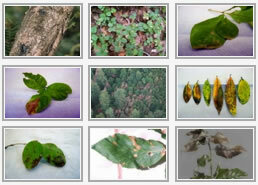 For more specific details about P. ramorum, go to the Global Invasive Species Web Database. Visit Forest Phytophthoras of the World for science-based information to aid in the understanding and management of the world’s forest Phytophthora species. The movie below shows a sporangia releasing zoospores. In California, infestations in natural settings have been found in 15 central and northern coastal counties (map below): Humboldt, Trinity, Mendocino, Lake, Sonoma, Napa, Solano, Marin, Contra Costa, Alameda, San Francisco, San Mateo, Santa Clara, Santa Cruz, and Monterey. In addition, P. ramorum has been found in Curry County, Oregon. In Europe, P. ramorum has been identified in several countries on nursery plants; it has also been isolated from forest trees in the U.K., Ireland, and the Netherlands. It is not considered native to North America or Europe, but its native range is currently unknown. For more maps, please see the Maps page. includes information about what Sudden Oak Death is, how to find help if you suspect your tree or host plant has the disease, and how to get on the mailing list or become a member of the California Oak Mortality Task Force (COMTF).